The first thing that struck me about Jill Konrath’s best-selling book Selling to Big Companies was the voice. It is plain-spoken, direct, commonsensical, no-BS. And it is completely guileless. When I first met Jill, it was immediately apparent that these are personal traits. She is a Minnesotan—a Midwesterner of the old school. My grandparents and parents were from Nebraska; I knew exactly who Jill the person was, and why the book was an extension of her. But Jill knew something I didn’t know. I came to selling from consulting. Jill came to selling from selling. For me it was an extrapolation from a related field; for her it was a version update, a call to the profession. To my surprise and delight, we ended up in the same place. Her book is not just about moving from small-time selling to Big Company selling. It is also about moving from the “that was then” to the “this is now” world of the corporate buyer. She is an astute psychological observer, along with Scott Adams of Dilbert fame. She knows what it means to work in a downsized world with out-of-date corporate-purchased Blackberries, defined contribution plans, and 10PM phone calls with other time zones–and what that all does to the buyer. Charles H. Green: Jill, thanks so much for doing this. I wanted to honor your work, starting with Selling to Big Companies, and moving on to your more recent book, SNAP Selling. But let’s start back in time. When and how did you first get into selling? Jill Konrath: Let me start out by saying that I never, ever wanted to be a salesperson. I viewed it as a despicable profession filled with slimy, schmoozing, manipulative hucksters. I answered, “If it’s such a good idea, shouldn’t it sell itself?” He laughed at me and told us someone had to learn to sell. So, I got into sales by default. My friends refused, so if I wanted to start the company I had to learn how to do it myself. CHG: So where did you get your start? And, was it what you thought it was? JK: I was fortunate to get hired by Xerox, a company that literally had the best training program in the country. And, I discovered it was entirely different from what I thought. My image of a salesperson was based on the worst of the profession. At Xerox, I learned how to be customer focused in everything I did. I found out that I could be successful only if my customers were able to achieve their goals. From there, I sold technology systems for three years before starting my own company. CHG: So, you didn’t go back to SCORE? JK: Funny thing, but after working at Xerox, I totally abandoned my initial entrepreneurial dreams. Being in sales was just too interesting and challenging. CHG: So, then you progressed through your sales career, you came to have a different view of sales; you realized that Big Company people were no different, really, than any others. What was the core realization you came to as you came to write SBC? JK: Charlie, I actually wrote Selling to Big Companies for my friends and colleagues who worked for small businesses or owned their own firms. They were such talented people, but were really struggling financially. Many of them felt they had to prove their worth by working with small companies before they tackled larger firms. So I wrote my book to show them how to get corporate clients who had budget allotted for their services and who appreciated their value. And yes, I knew that corporate decision makers were normal human beings because I worked for a big company and I sold to them as well. CHG: What’s wrong with sales today? Is there a “single biggest problem” that you can point to? One “biggest opportunity” that salespeople can work on? Second, and very related to #1, is that our prospects/clients don’t care about the product/service. Nada. Not even one little bit. All they care about is their ability to achieve their objectives. I am continually appalled at the sheer lack of knowledge most sellers have about their customer’s business, market trends, key issues, strategic initiatives, and key success factors. Without this business acumen and customer insight, sellers are functionally unable to plan an effective account entry campaign, help a company change from the status quo or win business from competitors. CHG: Let’s not forget to talk about your latest book, SNAP Selling; how do you see it in the sequence of your evolving thinking? What’s that book about in the big context? JK: SNAP Selling is all about selling to crazy-busy people – which I happen to think is most everyone today. They’re overwhelmed with work, have fewer resources at their disposal and impossible deadlines. Plus, they find it much easier to go online to research their issues, challenges and possible solutions. In short, they have no time for salespeople who waste their valuable time. It’s having a huge impact on sellers. It’s nearly impossible to set up meetings. Getting companies to move off the status quo can take forever. And, differentiating is sometimes impossible. In short, we’ve entered a whole new world of selling which requires us to use fresh strategies – or risk irrelevance. In SNAP Selling, I cover the new rules of selling and share multiple examples of how to implement these strategies for dealing with frazzled decision makers. CHG: I should also mention to readers about your most excellent blog, also called Selling to Big Companies. I’m a frequent, almost-daily, reader. JK: Thanks for the plug! CHG: What’s your advice to someone going into sales these days? What should they focus on? JK: Understanding their customer first and foremost – and then aligning everything they do with their customer’s business objectives and priorities. CHG: How about someone who’s further along in their career; what’s the One Big Thing they can learn to do better? JK: Becoming an invaluable resource. They should develop deep expertise in their niche, market segment, process – or some arena that is of high value to their target market. Also, they should continually be sharing ideas and insights to help their clients be more successful, as well as connecting them to other valuable resources. Our crazy-busy prospects are desperately looking for people they can count on – and when they find them, they are extremely loyal. 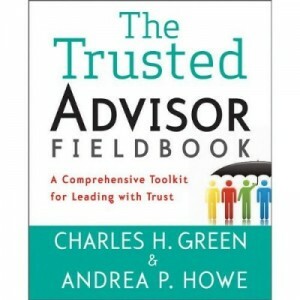 CHG: I don’t know about you, but I always get people asking me for “tips and tricks.” I don’t know what they think they’re going to get; there are a few, but “tips and tricks” are not where it’s at, I don’t think—it’s mindsets. But what about you? How do you answer those people? Have you got some? JK: I have this special fairy dust that I sell to all my clients. It magically transforms them from self-serving salespeople into invaluable resources. Just kidding. Honestly, I tell people to do a “mind meld.” It’s imperative for them to look at their own behaviors from their client’s perspective. For example, if they’re going to leave a voicemail message, they should call themselves first and see out it sounds. Most people are appalled at how bad they are and would delete their own messages. This same practice can be applied to presentations (boring! ), proposals (unending! ), meeting plans (one-sided). It’s amazing what they can learn when the see their own behavior from another perspective. After you learn to do this, it totally changes all your client interactions. CHG: Can you step back and envision sales 15 years from now? That would be, umm, the year 2026. Whew. What will be the state of Sales in the future? JK: Yikes. Well, first I see a major reduction in the number of salespeople. The ones who are eliminated will be the old style sellers who think it’s all about schmoozing and pitching. Since they personally add no value to the sales process, their prospects would prefer to buy online. For those who remain in sales? I think the future is brighter than bright! In fact, these smart, business-savvy individuals will be well respected and in great demand. Plus, they’ll be highly paid because of the tremendous value they bring their organization and their clients. CHG: Jill Konrath, thank you so very much for taking the time to talk with us, this has been a delight. JK: My pleasure. It’s been fun talking with you. 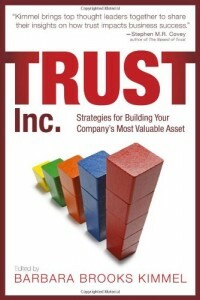 Books We Trust: Selling to Big Companies is the second installment in our Books We Trust series. The first was You’re Working Too Hard to Make the Sale, by Bill Brooks and Tom Travisano.